Korea, "Land of the Morning Calm," is a land of opposites existing in conjunction with each other. It combines ancient Oriental tradition with modern technology. It’s the nation which transformed itself to economic power with a lightning speed. Delight, excitement and rushing adrenaline…all at the same time when I got the news of packing bags for Seoul? Curiosity took me to internet to google about Seoul. I was in for a cool shock on seeing heaviest snowfall in South Korea in 70 years. That send the shivers down my spine. Whatever winter gear I could have taken along with, I started with that. 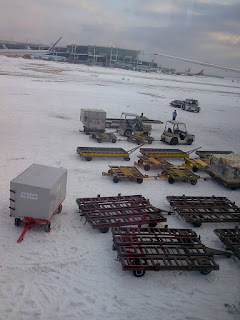 Such was the landscape on Seoul Airport, everyone instead of moving out was clicking the pics. 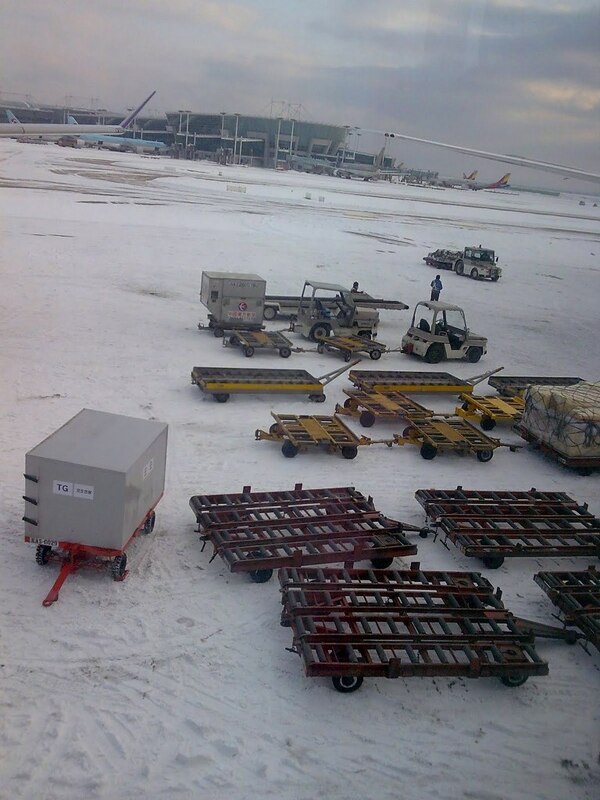 From the Incheon Airport to the Hotel I was welcomed by snow, snow and snow. Only colour I was seeing was "WHITE". Knee height snow was motivating/ demotivating, didn't knew - but I was enjoying. There were cars, bikes - well under the snow, don't believe me - See it for yourself. Next day I was supposed to report to the office. Excitement was high on account of meeting new friends. 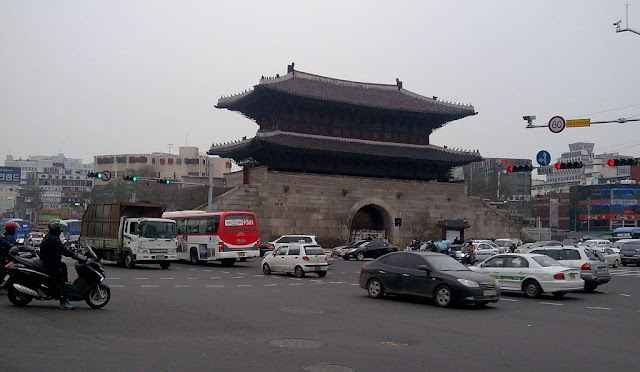 In downtown Seoul, one can find traces of its 5,000 year history in its palaces, city gates, and temples, yet the country is also a rapidly developing nation in terms of industry, trade, and commerce. The Seoul Tower : This is the landmark of the city and is visible from most of the city. Jogey Temple : A small and beautiful Buddhist temple in Jogno, near to my office. 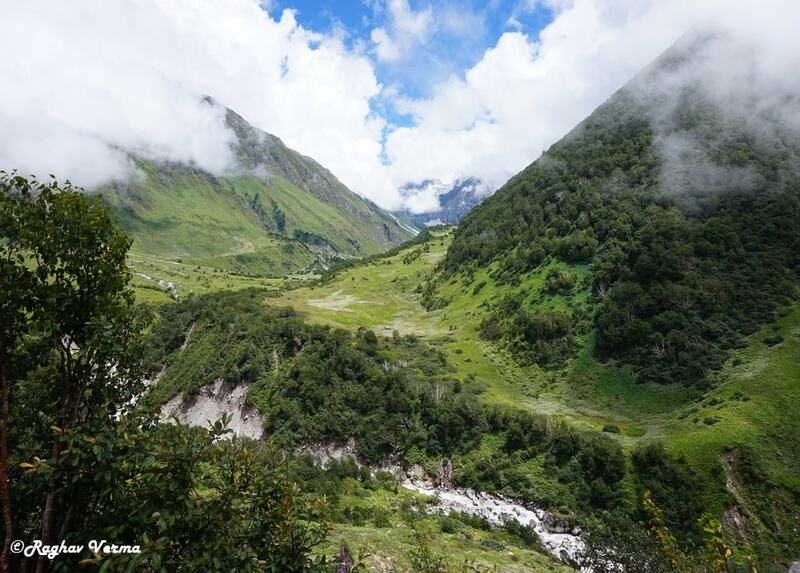 Suraksan Mountains : Destination for trekking and nature loving enthusiasts. Namdaemun Market: Take Subway line 4, Hoehyeon station, exit 5 to reach the market which dates back to 1414, time of King Taejong. Walking is the only option to explore this market. This is one market where you can get almost everything at very attractive rates. 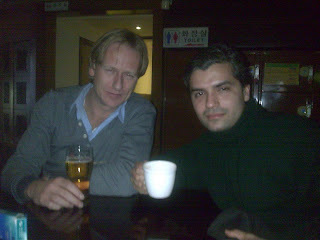 City is full of energies, even streets at night are not without the activities. 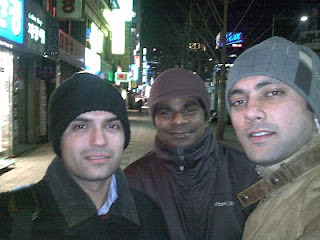 Being in Seoul is fun, meandering in the streets has its own pleasure. Subway is the best way to travel in Seoul. Almost every part of the Seoul has been connected by Metro train. Seoul Metro is perhaps the best one in the World. Take a map in hand and start exploring. Not only travelling Seoul Subway is host to beautiful shopping arcades, eateries and a lot of happening places to keep you occupied and in good spirits too. Can you imagine this is an entrance to one of the Subway Stations...? Insadong is a street renowned for the artefacts and antiques. Nice place to take back the souvenirs from Seoul. Magnificent designs will take you deep inside the Korean culture. If you admire Indian Food, there are lot of Indian restaurants too. If you are a cooking enthusiast then there is a shop selling Indian food stuff/ grocery, by the name "Foreign Food Mart". Again they say while in Rome, do as the Romans do. You can enjoy Korean delicacy, you are in Heaven if you are a "SEA FOOD" lover - you will get whatever you can think of. I too tried my hands on Korean food in Korea, however last 2 statements are not correlated. I used to search for Vegetarian Cuisine. The Pancakes, Waffles stuffed with Strawberry/ Vanilla/ Chocolate cream usually sold at roadside vendors are simply too yummy to resist. You can keep on having these and keep on walking around the place, that's amazing combo. 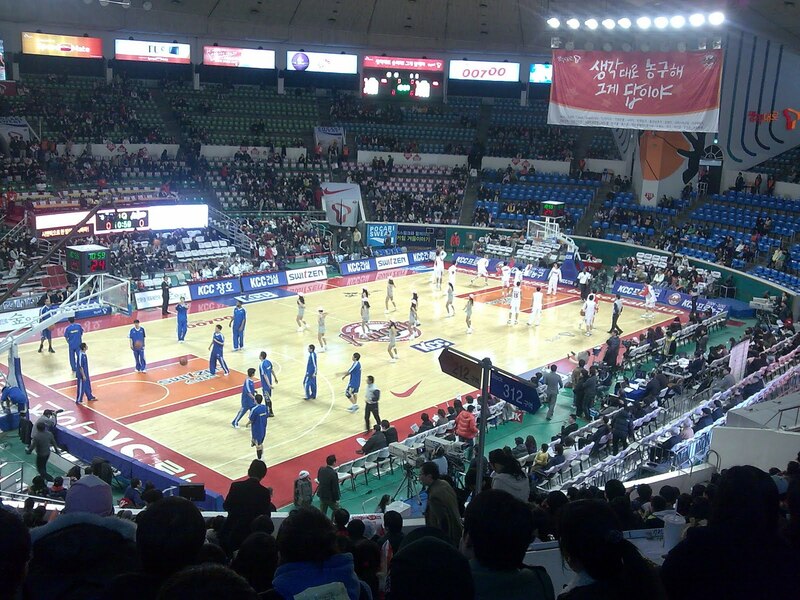 Seoul has hosted Olympics way back in 1988. Sports enthusiast will not be disappointed, just walk to Sports Complex. One fine Sunday we also went to watch a basketball match between SK (our company) and Samsung. Atmosphere was rocking to the extent it could have been. Being the first time I got a chance to watch such an event, I could not have asked for more. The only grudge I had after the match is that our team SK lost the match. I am seeing only big cars here in Seoul. All big cars and SUV's decorate the roads here. However the Daewoo "Matiz", the Cute small car still is a pleasure to be seen along with big boys. My office is around 20 minutes walk from the hotel. Walking down the streets, wondering around with friends or alone at sometimes is enriching and enjoyable at the same time. Being alone gives you the freedom of meandering anywhere, explore anything and moving as per your wish is simply overwhelming. Check out the time we 3 musketeers have while walking back to hotel. Sometimes in group, most of the times alone - nonetheless walking at the nights to my hotel used to be the most enjoying time of the day. I had the liberty of taking any turn, exploring whatever used to my way. I remember the first time I was going around the Cheonggyecheon Stream with Pushpender, when it started to snow. We had to take shelter in a nearby shopping store as soon as I came to know that my mouth was freezing, for a few minutes I was unable to speak anything... The smile is plastic, only for getting the picture clicked. In reality the cold was beating the hell out of me...however no problems...it was another amazing experience of its kind. Weekends were occupied with outdoor activities, being a trekking enthusiast mountains used to pop out as a favoured destination. There was no second thoughts as soon as I got to know about "Suraksan" and "Bukhansan" mountains. If not the mountains, there is enough activity all around to keep you occupied... continue exploring and enjoying the South Korea. Their commitment to the cleanliness and discipline is worth appreciating and learning. 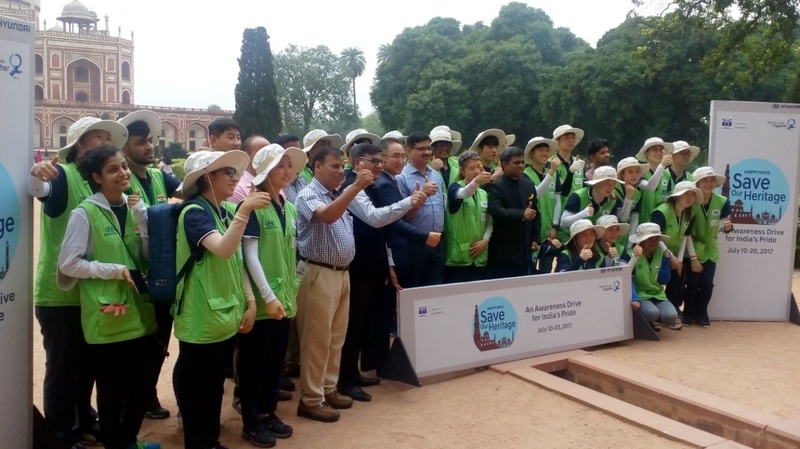 Korea amicably shows that everyone has a responsibility towards society and with everyone's efforts how the countries can get transformed in a short span of time. Filled with energies me and sanjeev started at 3 PM for Seoul Tower, the main landmark of the Seoul City. It turned out to be much nearer than our expectations with only 2 stations; Chungmuro and Myeong-dong (Stop no. 423, Line No. 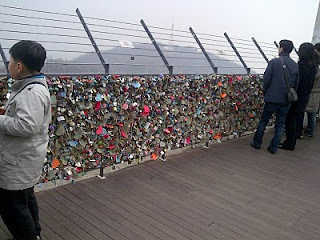 4) separating us from the Seoul Tower. Coming out from EXIT NO. 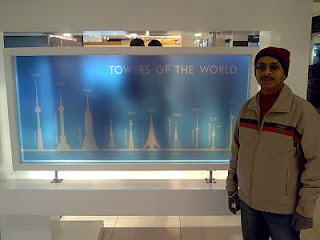 3, Seoul Tower was on our left hand side, the majestic presence of Tower can be seen and felt. One of the very few occasions, when we were saved from the asking directions. We started our charge to the tower with the high spirits, the steep slope looked like challenging us - We were more than ready to accept anything. From Namsan one can take the cable car to the top of Seoul Tower, but trekking is trekking; amazing in itself and good for health too. What a view it was, the towering presence of the Tower was challenging to come..come..come..quickly. The strikingly carved out steps and way presented a pictursque panaorama, reminiscent of an artist brush. Traces of snow in the way perfectly provided the icicng on the cake. 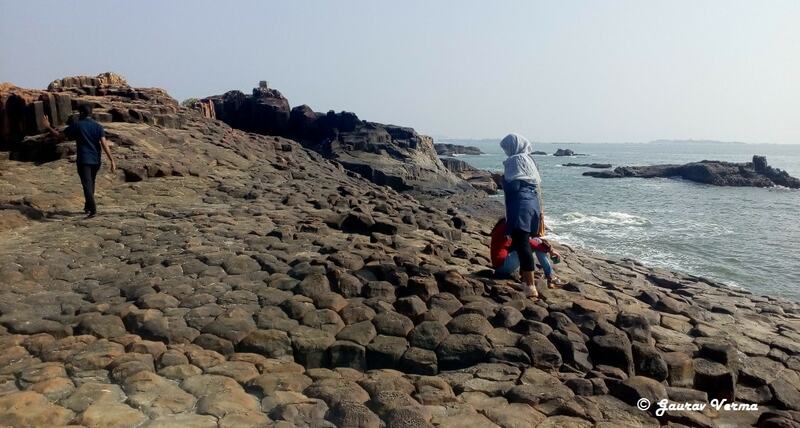 no doubt from kids to olders, everyone was having a great time in reaching to the top. Travellers never think, they are foreigners. I too made a few friends in way..do I look like a foreigner. 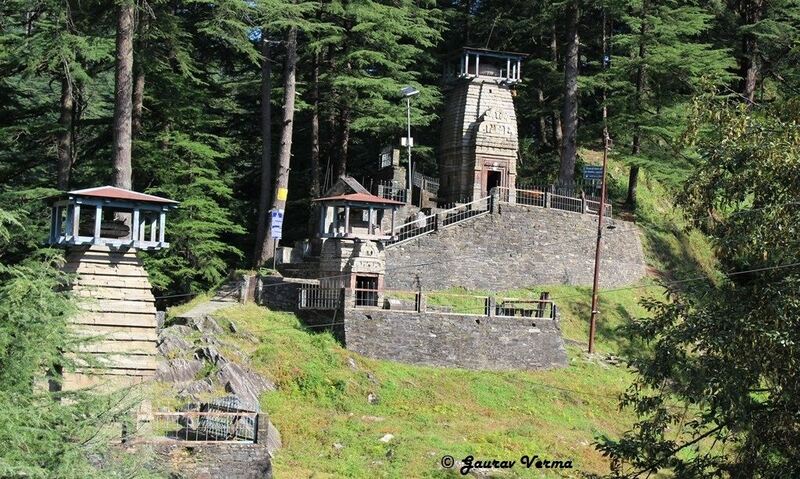 View from the top is what makes a journey of 100 steps so exhilarating. 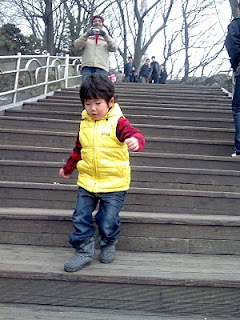 We started to cover the steps, one at a time. We were sweating, for the first time in Seoul and we were enjoying. You will find all amenities in the way, its a long way to go you even can have some workout to to build the required strength strength, which will propel you to the top. I am at the top..Deja Vu...!!! If you expect Seoul Tower to be just a tower, you will be in for a pleasant surprise. The place had a Teddy Bear Museum, variety filled restaurants, number of artists to paint you and a comparison in heights of highest towers of the world. The Fairy Land has several exhibits with Disneyland-like robots depicting famous fairy tales and children's stories. Isn't it a nice place...???? On the extreme left is a real kid, confused - who is being photographed..?? The Global Village Folk Museum display products and handicrafts from around the world. the World Musical & Animal Land has life-sized robots similar to Fairy Land, depicting animals from around the world in a musical band. There is everything for everyone; from kids to elderlies adn from singles to love birds and couples. Well....they sell locks in the gift shop for you to personalize and lock onto a fence for decoration, great idea! A coin has 2 sides, such love filled locking gesture also has one disadvantage side - “As the number of locks increased, almost all the fences are filled with them, it is hardly possible for children to enjoy the surrounding view. When these children will grow up they will surely complain about lack of fences to put their locks. Any Parents listening...??? The best to know about a place is by foot. Following the same, we decided to test our feet for the return journey. Keep a map of subway, you will never get lost in Seoul. 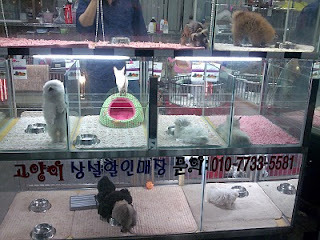 Shops were lightening the streets, the most spectacular were the pet shops. The cute small dogs, puppies were waiting for their owners in beautifully carved enclosures, which reminded us of jewellery shops. By the time we returned to our hotel, out stomachs were already asking their due. This night I am gonna have a hefty dinner. Nice place to rejuvenate, unleash your energies, a must for every traveller to Seoul to see it..